Centrally located between exits 23 and 25 from Interstate 77, the Northstone Country Club Community is home to over 900 fine homes, many with views of the 20-acre lake. The private golf course was designed by P.B. Dye and offers a challenge to golfers of all levels. Clubhouse amenities include a swimming pool, tennis courts, a recreation area, and a full workout facility. Annual memberships are available in a variety of different categories. 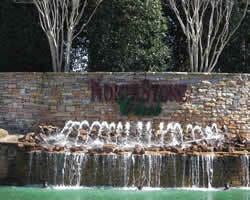 To view information about the Northstone homeowners association, click here. Homes in Northstone range from the $300s to $500s. Looking for Northstone homes for sale? Looking for Northstone homes for sale? Search our local listings database for access to listings in Northstone and surrounding communities. Whether you want to buy or sell Northstone real estate, you can browse through properties or find a wide variety of real estate resources available on this website. If you are looking for a REALTOR® for Northstone, choose Debbie Sloan. As your Northstone real estate agent, Debbie Sloan can assist you with all of your home buying and selling needs. We can provide you with access to the Lake Norman local listings database and offer our experience and knowledge to make the home buying or selling process easier for you and your family. Contact Debbie Sloan today to get your home search started!